The cryptocurrency market crashed in early 2018 for a plethora of reasons. Some of these reasons were out of our control while some might have been our fault. In early 2018, the cryptocurrency markets started crashing. Bitcoin hit an astronomical all-time high of 19,000+ in USD, and that made it seem as if the sky wasn’t the limit, but the moon was. The market cap of the entire crypto market surpassed 800 billion dollars worldwide. 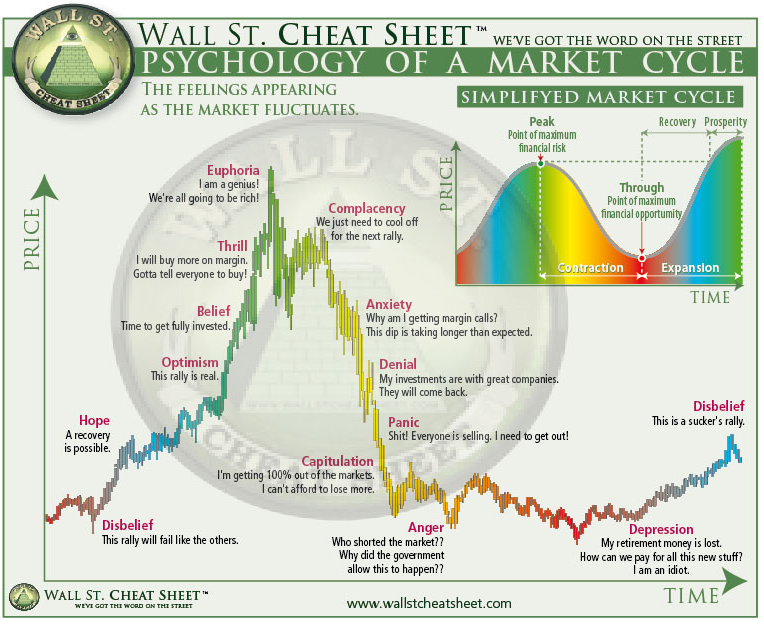 According to the Wall street cheat sheet, we must have been in the euphoria stage. 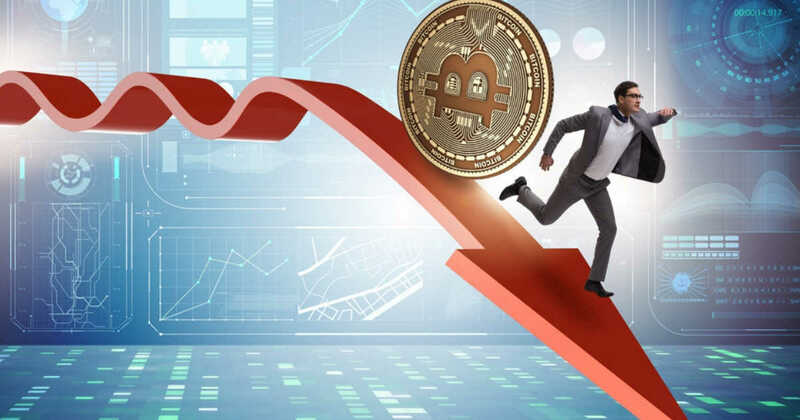 Right before the next drop, that according to the market cycle would happen within two months, the crypto market leveled near a market cap of 200 billion and within a month doubled back up to 400 billion. Everyone had another chance to make some serious money when the market cap increased, however, at that stage, everyone had run away, well most of the “retail investors,” and the “average joes” of the world. A few months later, crypto went from 400 billion to the lowest its been in 2 years, a bottom of 100 billion USD. What leads to this wild crash? 1. Mass media outlets all around the world were reporting the astronomical rise of bitcoin. Retail investors or the average joe was buying into the rise of bitcoin and all the other cryptocurrencies. A psychological factor that played a role in this was the herd mentality: “I’m going to buy it because everyone else is buying and this makes me feel safe about my purchase.” People who didn’t understand cryptocurrencies were buying into it blindly. 2. While Bitcoin was rising in value, many news outlets and journalist were comparing it to the tulips mania. They called Bitcoin a bubble. They were inciting fear into all the retail investors. People with major profit margins started selling and created pressure amongst everyone. No one knew whether to hold or sell, but at the time, everyone promoted the HODL strategy. Hold your coins, and this will come back up. The problem? People hodl’d through their profit and then sold with losses. 3. As bitcoin value dropped, retail investors started selling, and they were cutting their losses across the board. Mass media outlets like CNBC, Cheddar, Bloomberg kept promoting the major loss in value and calling it the demise of bitcoin and that it truly was a bubble. 4. During the time, Initial coin offerings were also a major cause for the rise of cryptocurrencies as well as its demise. ICO’s were promoted as a quick 10x on your money; some bad actors took advantage of this and created a few scams. A recent study from the Statis Group revealed that 80% of ICO’s were scams. People were afraid of this as well and completely shifted away from buying into an ICO. Millions of dollars were lost to ICO’s, and this created even more panic. 5. Cryptocurrencies were seen as a “get rich quick” event. Everyone was telling their uncles, aunts, mothers, brothers to invest in crypto. The problem with this was that the new people coming weren’t doing any research but hinging on the words of friends and family. This led to a weak foundation of investors. They then turned to the mass media outlets for guidance and once the narrative shifted from a prosperous cryptocurrencies market to a “bubble.” They then decided to sell along with the big margin profit holders that had sold as well. 6. Market cycles are common occurrences in many fields, real estate, stocks, you name it. Crypto being youngest of them all had experienced the biggest euphoria stage. According to the wall street cheat sheet on market cycles, the fall in value was imminent; everything that goes up must come down. But there were too many factors that we already touched on that mad this happen even sooner. These 6 points were all the significant reasons cryptocurrencies started to crash. It was a combination of fear, inexperience, lack of knowledge about investing, the average market cycle of value loss after enormous value gains, and bad actors. The best thing to do with any new market you enter is to find people who have been in that field for quite some time. You must also learn the in and out of the market. Many individuals around the world lost significant amounts of money, and others made even more but at the crux of it all was the knowledge about the market and the control of emotions. Previous articleWhich Countries Have The Best Cryptocurrency Regulations?